Summary: These far-from-spectacular figures were no surprise. Indeed, both revenue and profit have stagnated for five years now and there was no real suggestion that improvements will occur anytime soon. What’s more, a new regulatory risk was disclosed that may hinder progress :-( Nevertheless, this specialist currency manager did talk of future special dividends, while the high-margin, cash-rich nature of the business remains attractive. I reckon the underlying P/E is 8 and the yield is 6%-plus, and I continue to hold. November’s frustrating interim results, followed by trading updates in January and April, had already signalled REC’s full-year performance would be far from spectacular. REC managed to maintain its revenue because lucrative — but short-lived — client mandates won during the year offset the mandates that were lost. …and that a small performance fee of £315k was earned (suggesting at least something is going right with REC’s currency-management strategies). REC claimed the Passive Hedging division provides a “strong and stable revenue stream”, presumably because Swiss pension funds are required by regulation to use such hedging. For 2015, a quarter of revenue was derived from such Swiss clients and I estimate a similar proportion was received during 2016. REC’s 10% profit drop was due largely to a company-wide 10% pay rise for staff. The extra payments were “in response to the general trend of higher fixed remuneration in the financial services sector”. I’ve written before about this pay rise being somewhat galling for shareholders, who have witnessed their own dividend income stall this year as REC’s revenue goes nowhere. Back in 2012, there were only two million options in issue. Meanwhile, new office-lease agreements are set to cost the group an extra £316k a year. I may be moaning about REC’s lacklustre revenue progress and rising costs, but the business does retain some very attractive accounts. The cash production has allowed a substantial £20m to be distributed as dividends since 2012. Though net cash and investments in my table above is reported at £30.7m, my calculation of surplus net cash and investments comes to £22.2m, or 10p per share, after adjusting for regulatory capital of £8.5m. Other positive ratios include operating margin and return on equity. Despite the staff pay rise, REC continues to convert 30%-plus of revenue into profit. The firm also requires a very small capital base to operate. * The results highlight — a hint of a special dividend! The sole positive surprise from these results concerned management talk of a special dividend. “Since listing nearly nine years ago, the Board has been attentive to its responsibilities in building and maintaining a strong and sustainable balance sheet, ensuring the business is able to invest selectively in future growth whilst maintaining cash resources sufficient to support its needs. So it looks as if earnings from here on in may be entirely paid to shareholders via dividends. I just wonder if this decision has coincided with REC’s founder and 32% shareholder, Neil Record, becoming a non-executive the other year. Perhaps he is looking to boost his income now that he no longer collects a hefty executive wage. The talk of special dividends could also be interpreted as REC admitting it has limited potential to reinvest its earnings — and might even signal the business perhaps giving up on trying to expand in any meaningful way. (I have long wondered whether REC would stand a better chance of flourishing as part of a larger banking group). Something else to note is REC’s use of the word “potentially” in the phrase “potentially in the form of special dividends” — it does open the door for the less appealing share buyback. REC has always been dependent on a small number of large clients. The past year underlined the dangers of such a customer base, with large client mandates both coming and going (but mostly going) with little or no notice. This concentrated customer base is not great, but surely those clients REC has retained must have now dug in for the long run. I mean, these loyal clients have had every reason to jump ship due to the “narrowing expectations of interest rate differentials” and the like for the last five years. These results were the first to refer to potential reforms within the derivatives markets. “We are…concerned about emerging differences in regulation across these jurisdictions which may seem minor in the context of the overall regulatory picture, but which may have a disproportionate effect on Record given the nature of our business. In particular, we are concerned that whilst deliverable foreign exchange forward contracts have been exempted from the definition of “swaps” under Dodd-Frank and hence from much of the consequent regulation, the latest draft rules under EMIR continue to mandate variation margin for foreign exchange forward contracts entered into by financial counterparties, which include pension funds. Mandating variation margin is a major change from the historic practice of many of Record’s clients of using non-collateralised foreign exchange credit lines. I must admit I have no idea whether all this will cause problems for REC — or how major any problems will become. For now at least, “mandatory variation margin” is just another niggling concern to add to the list with this business. That said, I suppose there is a slight hope that the proposed European reforms may ultimately follow those of the US and exclude currency contracts from the changes. It’s quite possible REC’s lacklustre progress, concentrated client list and potential exposure to regulatory changes could be entirely priced into the shares right now. 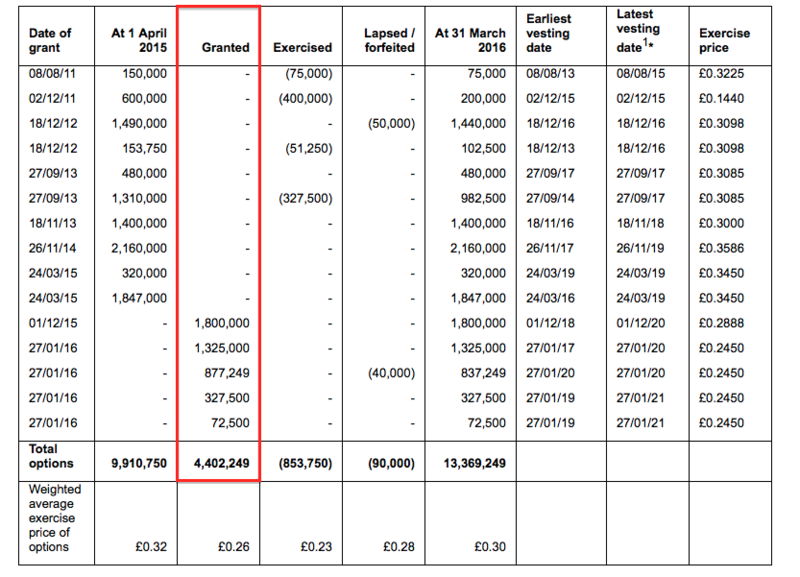 After standard 20% tax, my revised sums suggest earnings could be £4.2m or 1.88p per share. Previously I was anticipating 2.07p per share. REC’s market cap at 25p is £55m. Adjusting that for my surplus net cash and investment figure of £22m, I make REC’s enterprise value to be roughly £33m or 15p per share. Then dividing that enterprise value by my latest 1.88p per share earnings guess, the P/E for the underlying business comes to just 8. Meanwhile, REC’s anticipated 1.65p per share dividend for 2017 supports a 6.6% yield. I suppose that is a useful income to collect while the business continues to struggle to grow. The directors enjoyed a 10% pay rise alongside staff last year. They remain on chunky packages, aided by the bonus scheme that distributes 30% of profit to employees (as a mix of shares and cash). Pension contributions are a hefty 15.5% of salary, too. 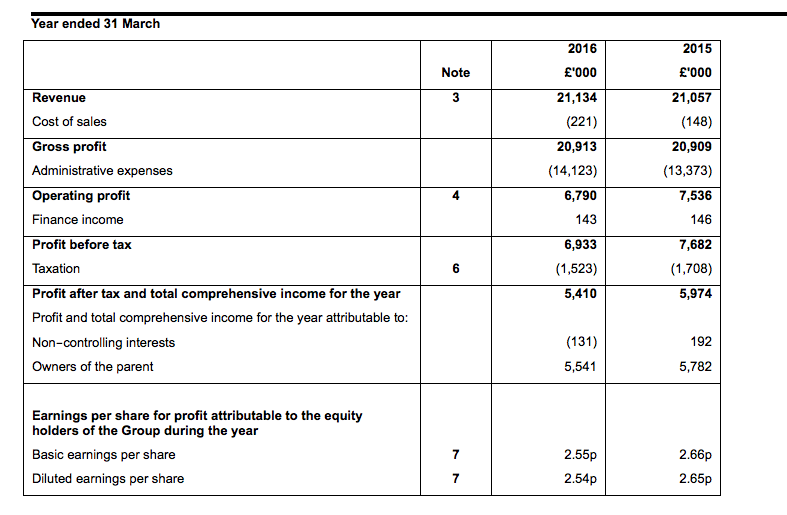 Something to note is that the whole board’s £2.5m cost compares to an operating profit of £6.8m. I speculated in the Blog post above whether REC would stand a better chance of flourishing as part of a larger banking group… and the board costs are there to be cut for any purchaser. I could not see any great revelations within REC’s ‘Mitigation’ notes. It claims that earnings last year would have increased by £653k if GBP had been 10% weaker against USD, and £583k if GBP had been 10% weaker against CHF. Such currency movements have actually occurred since Brexit, with GBP now buying 1.33 USD and 1.30 CHF. So that means, at least on last year’s result, profit would now be £653k + £583k = £1,236k higher. That is a substantial sum when reported earnings were £5,541k. My own sums support the theory of a post-Brexit FX boost. With GBP at 1.33 USD, I reckon management fees could be £20.8m versus the £18.8m I calculated in the blog post above with GBP at 1.47 USD. Applying the same costs as per the original Blog post, I now arrive at an operating profit of £6,582k and earnings after 20% tax of £5,266k (versus £4,156k I had previously calculated), which equates to 2.38p per share. On the same EV of 15p per share as before, the cash-adjusted P/E comes to just 6.3x. That multiple does look low, even with the business having trod water for years, the well-rewarded directors, the risks involving major clients leaving and the threat of “mandated variation margin” to certain currency trading. Excellent point on the weakening Sterling. I am also wondering if the increasing volatility can help with the flat-lining AUM? Note the first point “general absence of persistent themes of individual currency strength or weakness” – if Sterling is taking a pasting, you would think that Record are going to have people beating down their doors in the next few weeks to mitigate their risk? “For James Wood-Collins, chief executive at Record Currency Management, sterling volatility, rather than weakness, is the main enemy. I am assuming when he talks about Sterling volatility as being the “main enemy”, it’s to his clients and not to Record? I am also wondering if the increasing volatility can help with the flat-lining AUM? In theory you’d have thought REC should benefit (from the weaker GBP). Most of the AUMe is denominated in non-GBP and so should now produce greater management fees when translated into GBP. Costs all in GBP should then lead to greater profit. That said, the CHF experienced sudden volatility last year (many REC clients are Swiss) yet there was no discernible improvement to the business. Indeed, in August last year, there was a somewhat strange announcement stating a client had withdrawn a substantial mandate as a “consequence of currency market movements” after the Chinese rout. So I am not entirely convinced further volatility will lead to extra mandates just yet. But I will be more than happy to be proved wrong! I would like to think that the recent GBP ructions have at least created more interest in REC’s services. Whether it actually transpires into greater AUM I am not sure. I suspect, but am not sure, that ‘volatility’ here refers to sizeable ‘random’ movements which I assume are more difficult for REC’s models to predict, and so is more likely to be bad for clients and the company. ‘Weakness’ may be seen as an ongoing currency ‘trend’ by REC’s models, which may be easier to hedge successfully. I notice that Record’s broker has come out with a new research note after the recent trading statement. It corroborates your latest comment regarding the effects of currency movement on profit. They also talk about the possibility of an additional 0.45p special dividend, which seems a little low, but I imagine they are taking guidance from management on it. The trading statement itself was a little disappointing. The business continues to melt (albeit slowly) with very little prospect of a reversal. The only vague possibility that things could get better was this line at the end of the trading statement. That suggests to me that they expect some new clients, but will this even be enough to stem the current bleed? Are you attending the AGM? Thanks for the Comment and pointer to the broker note. Agreed, the Q1 statement was a little disappointing but I don’t think anyone was too surprised about that. The share price does not reflect any future improvement in the business. Sadly school holidays prevent me from attending this AGM. To be honest I am not sure what the management could add to that already stated. I could sound off about staff enjoying pay rises and getting time out to make smoothies on bikes (don’t ask), but I am not sure I would get anywhere with that. There were no great surprises reported during the three months to 30 June 2016. Total effective client assets under management (AUMe) fell by $0.7bn to $53.0bn, but in sterling terms gained £2.3bn to £39.7bn. For the fourth quarter running, clients withdrew money on an aggregate basis — this time they left with $0.1bn. Perhaps the best news from the statement was client numbers advancing by 3 to 61 — the highest level since June 2010 (six years ago!). So smaller customers do appear to be coming on board, although they are not bringing enough money to offset the amounts withdrawn from departing clients. Less my guesses of £6,800k for staff costs and £4,616k for other costs as noted in the original Blog post above, then less the 30% profit share (of £2,731k), I arrive at an operating profit of £6,372k. Taxed at 20% gives earnings of £5,098k or 2.30p per share. On the same EV of 15p per share as per the original Blog post above, the cash-adjusted P/E comes to just 6.5x. I think that summary still stands. So maybe there is a touch of caution from management here. All in all, the elusive wait for some decisive client wins continues for at least another three months. At least my 2.30p per share guess covers REC’s anticipated 1.65p per share dividend, and perhaps could fund a special payout that the group discussed in its full-year results. A 1.65p-plus per share payout would offer a 6.6%-plus income at 25p. There were no great surprises reported during the three months to 30 September 2016. Total effective client assets under management (AUMe) advanced by $2.8bn to $53.0bn, but in sterling terms gained £3.2bn to £42.9bn. At least clients decided to place extra money with REC following four consecutive quarters of net withdrawals —- this time they deposited the equivalent of $1.5bn. Client numbers remained at 61 and a six-year high. Less my guesses of £6,800k for staff costs and £4,616k for other costs as noted in the original Blog post above, then less the 30% profit share (of £2,731k), I arrive at an operating profit of £8,189k. Taxed at 20% gives earnings of £6,551k or 2.96p per share. With the share price at 27p, the EV is 17p per share and my cash-adjusted P/E comes to just 5.7x. I think that summary still stands. That said, the valuation does appear low. So maybe there is fraction more optimism of progress for the financial year. As before, the elusive wait for some decisive client wins continues for at least another three months. Post-Brexit exchange rates now mean my 2.96p per share guess easily covers REC’s anticipated 1.65p per share dividend, and can now probably fund a special payout that the group discussed in its full-year results. A 1.65p-plus per share payout would offer a 6.1% income at 27p.